About a week ago, I said I was ready to leave already, and that still applies. Now it just feels like waiting around for the time to leave. Which I guess is exactly what I'm doing. In any case, today I got hold of a massive hiking backpack which I hope will work wonders. But it's always very tough to know how it'll be to bike ~120km per day with a massive backpack on your back. There's still a slight chance I might get a hold of some bags for the bike, but I'm going to bring the backpack regardless. I also got to borrow a sleeping bag for the trip, and hopefully it'll be slightly better than the "barely warm enough for indoor sleeping" one I own myself. 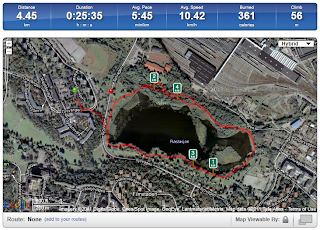 I rounded the day off with a double-lap around the nearby lake, and I even managed to hold considerably higher pace than I've ever managed before. 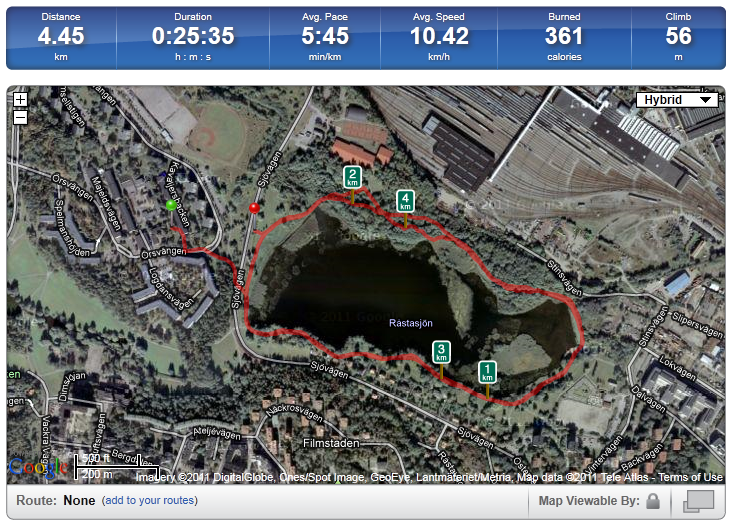 This is specially nice considering that two weeks ago, I was just running one lap, and at a slower pace. But then again, I know for a fact that I am pushing myself harder now than I have before. But I guess that's positive as well? Still got to say, running during the night is great. You have the world for yourself! I guess today's post won't be much more thrilling than this... Or wait! One more thing. Just for the sake of doing something that's fun, and most likely will fail. I've created a Spotify playlist for this trip! The playlist is open for collaboration, so I invite you to add whatever songs you feel like adding. What you add, is up to you, I only ask of you not to remove things from the list. I can't guarantee I'll listen to the playlist during biking, but I'll listen to it "at times", and specially if it turns out to be more than three songs stuck on repeat. Lastly, if you do not have Spotify, don't know how to use it, or simply don't give a damn, then you have my permission to ignore this entirely!